I love the Florence and the Machine song, Shake it Out. 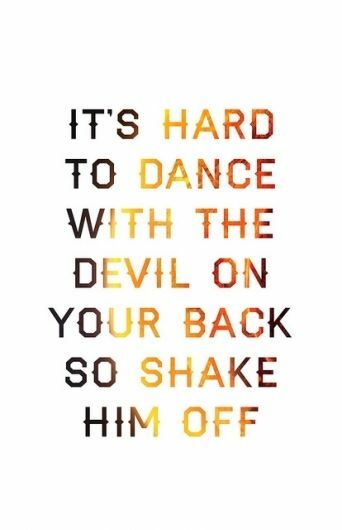 I particularly love the line that says, “It’s hard to dance with the devil on your back, so shake him off.” The more I’ve listened to this song, the more I found myself wondering what my proverbial devil on my back was. What is the thing that is keeping me from dancing, from freedom. I’ve been sitting with that question for a while. Each meditation would revolve around this same sort of sequence. When a “sticky” thought comes, stay with it, and trace back to where that thought came from. Is there some sort of belief or story under that thought? Intend to pay attention in my daily life to where that belief gets me caught in a reactive pattern. Here is one of my patterns, so you can see how it plays out in a practical way. Trace my thoughts back to see what beliefs I have. This one took a while, a few weeks, but I noticed that there is a deep belief about needing to be productive and check a certain number of things of my list. I notice that the need to check things off my list is preventing me from being in the present moment, not only now, during the meditation, but also in life. I’ll be eating dinner, and instead of focusing on the flavor of the food, I’m thinking about how after dinner, I’ll wash the dishes, clean the kitchen, and then get a load of laundry in. Before I know it, dinner is gone and I’m not satisfied and I’m rushing to the next thing. Breathe with the feeling. Allow it to be there, but still commit to noticing the breath and allowing the “”check things off the list” mind to be there, as I’m sitting and as I’m experiencing my breath. Just because I have that thinking, doesn’t mean I have to act on it. See that patterning, and set an intention to slow down and notice when I’m living in “check it off the list” mind. We all have different devils that pop up in our lives, and by taking a few moments to sit in meditation and investigate, we then allow ourselves the opportunity to practice not reacting to the devil and we create a little more space in our lives to see where that devil pops up outside of our meditation practice. Categories: how to meditate, meditation, mindful breathing, mindfulness, yoga | Tags: breaking karmic patterns, creating awareness, florence and the machine, mindful living, mindfulness, shake it out, yoga | Permalink. Sometimes, in life, it’s important to keep it simple. So, let’s do just that. Categories: 5 minute meditation, how to meditate, meditation, short meditation, yoga | Tags: meditation, relaxation, short meditation, simple meditation, yoga | Permalink. There are so many different ways to meditate. It can be overwhelming trying to find something that works for you. When my mind is particularly chatty, I like to do breathing meditations where I count my inhalations and exhalations. 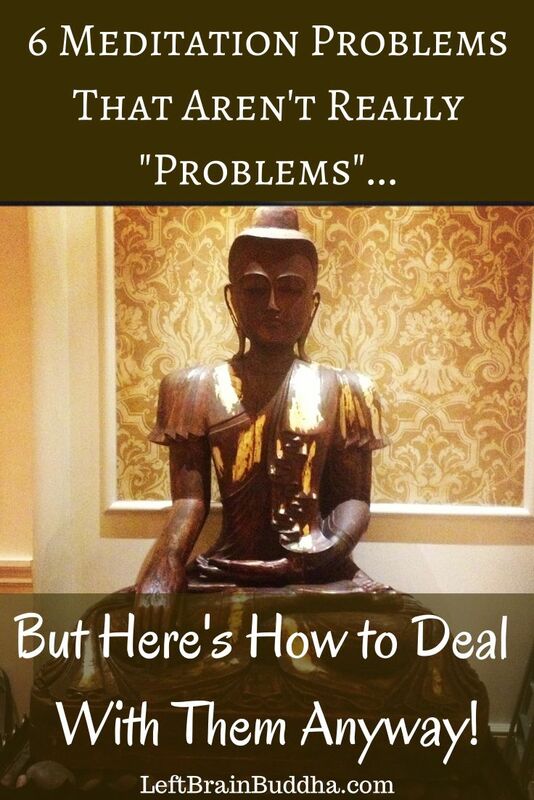 I learned a version of the following meditation in my yoga teacher training program. 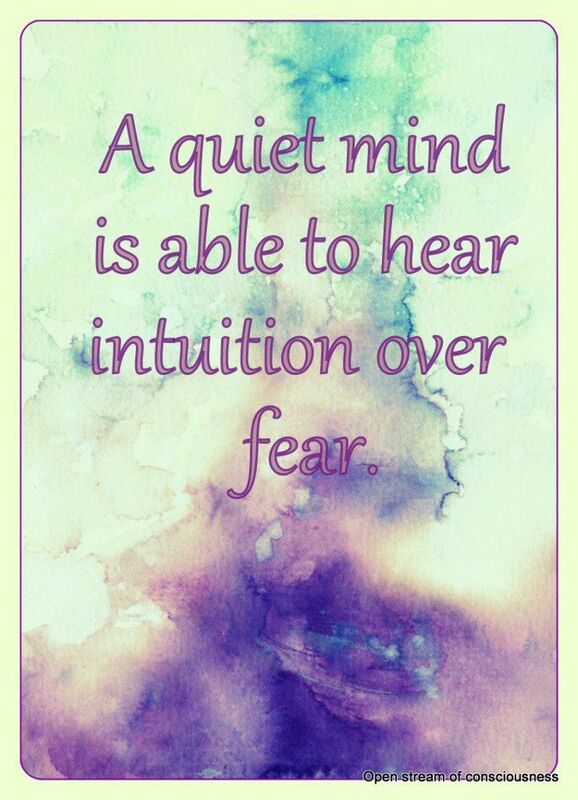 I have found this idea to be a wonderful way to calm my mind, deepen my breath, and come into my body when I’m feeling less able to focus. After a few breaths, tune in to the inhalation and count until the body wants to exhale. At the last number, retain the breath for a moment, feeling the fullness in the body. Then begin counting through the exhalation, and pause at the end to feel the sensation. Breathe in again and continue the counting meditation, trying not to worry about how long you’re inhaling and exhaling. Try to go with the flow, and change the numbers, not the breath. Some days, my body likes shorter counts, and some days, it prefers longer counts. Either way, it’s all good! 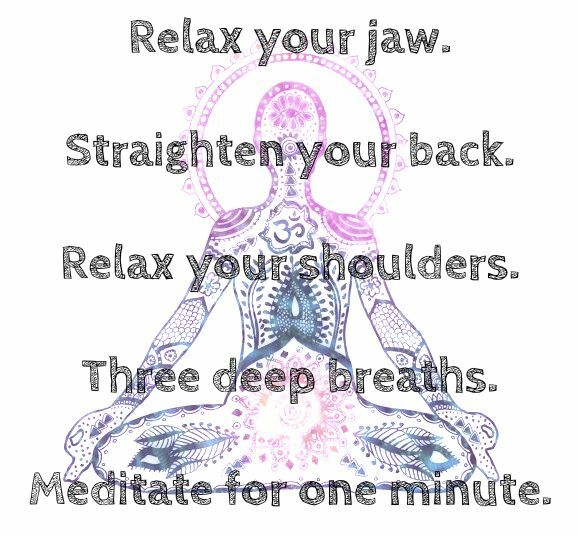 Today’s Opportunity for Mindfulness: Try one of these short breathing meditations and see how they feel! Categories: 5 minute meditation, how to meditate, meditation, mindful breathing, short meditation | Tags: breath, breathing meditation, calming down, short meditation, yoga | Permalink.